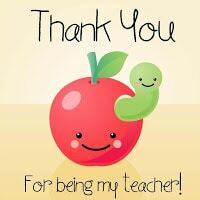 Do you have a “very special teacher” that you want to celebrate? 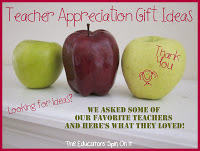 Here’s a fun way to engage your child and their classmates into celebrating their teacher for Teacher Appreciation Week or an End of the Year Celebration. All the caterpillar themed projects can be created in stations in less than an hour. 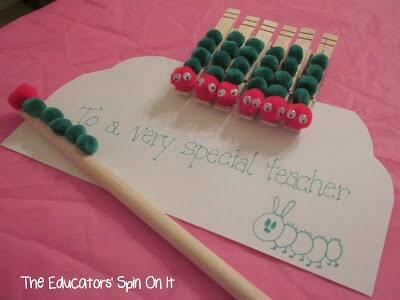 Encourage the teacher to sit back and enjoy while the students create keepsakes for the teacher’s classroom. Grab some parent volunteers and let’s go have some fun! 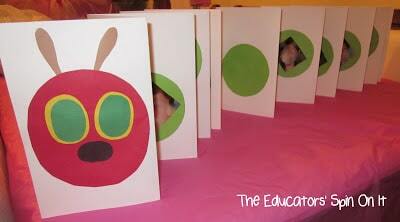 Using green and red paint have student place their handprint onto a long sheet of paper to create a class caterpillar to hang up for the teacher. Premake the lettering and the caterpillars head with construction paper. Make a Thank you card for the class by cutting out large green circles and then cut out smaller circles with their personal pictures on them. The same head in on both the card and the class sign. If you don’t have time to get a picture made of each child, just have each student draw a self portrait. 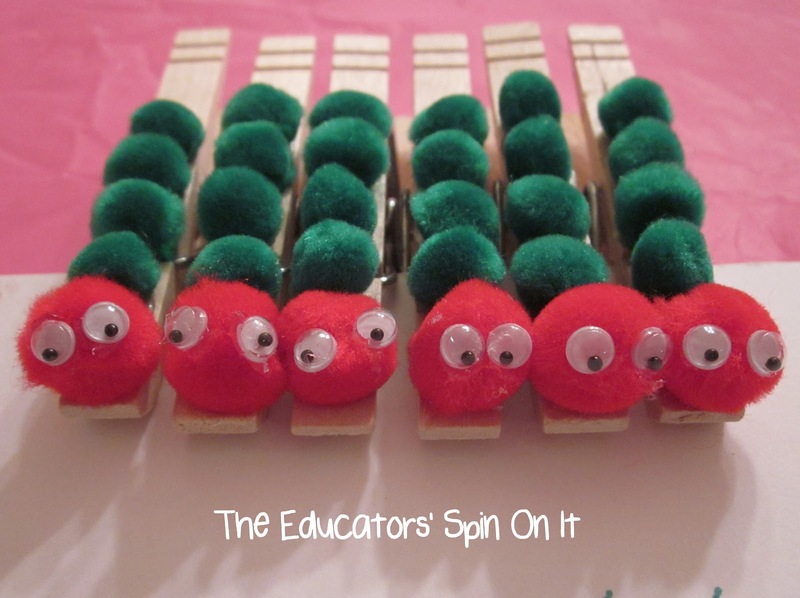 Using green and red pom pom have the student glue the head and body onto a clothespin. Then attach two eyes. Before they begin attach a magnet to the back so they can hang it on the fridge at home to remember the special party. Premake a set for the teacher. Using the extra pom poms create a teacher pointer to help the teacher read stories with and use for teaching reading. As a class buy The Very Hungry Caterpillar for your child’s teacher and then have all the student write their name at the front of the book for a book signing. 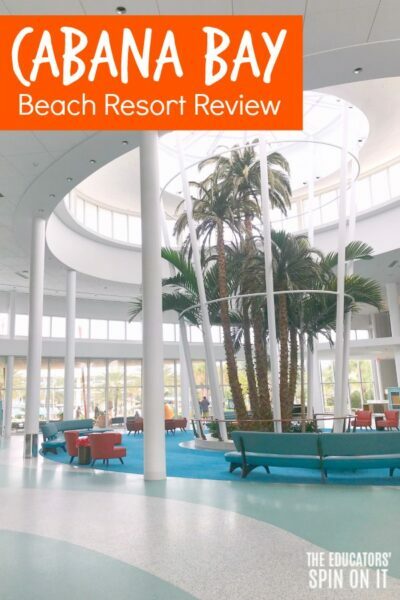 You could include a class photo attached inside too. What a fun way to remember a school year that to be presented with a book of personalized teaching photos from your own classroom. 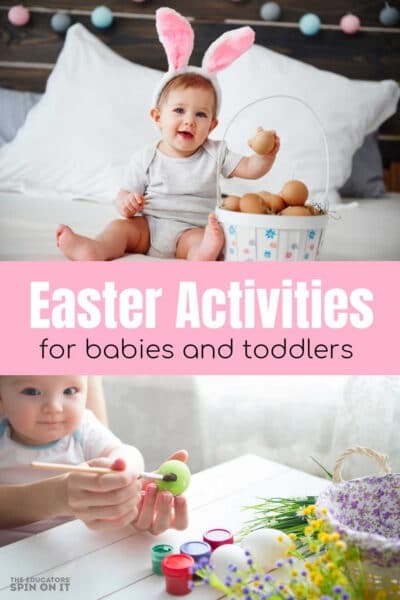 Here are some suggestions for what to include but the ideas are endless as to the special things your child’s teacher does with the class. On Monday ____ read us a story. On Tuesday ___ taught us to write. On Wednesday ____ helped us count to 100. On Thursday _____ took us to the playground. On Friday ____ sang songs with us. On Saturday _____ was writing her lesson plans. On Sunday _____ was a very special teacher all year long! 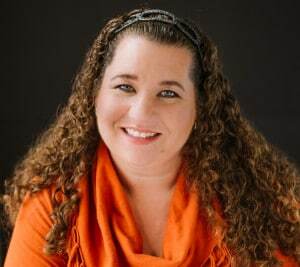 Thank you _____ for all your hard work and dedication! If you don’t want to take photographs you could always have each student create their own personalized page and create a book from it. While you’re present the book basket and listening to the Class Caterpillar Book you can enjoy a little caterpillar snack. Cupcakes shaped like a caterpillar are fun! You can also create a caterpillar from sandwiches. 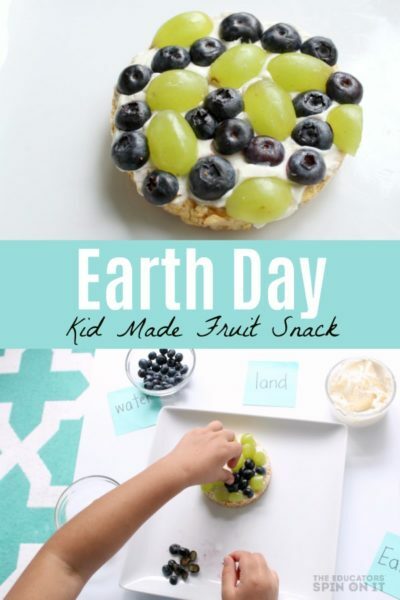 You can retell the story by cutting up fruit and poking holes into the fruit just like the story using straw. 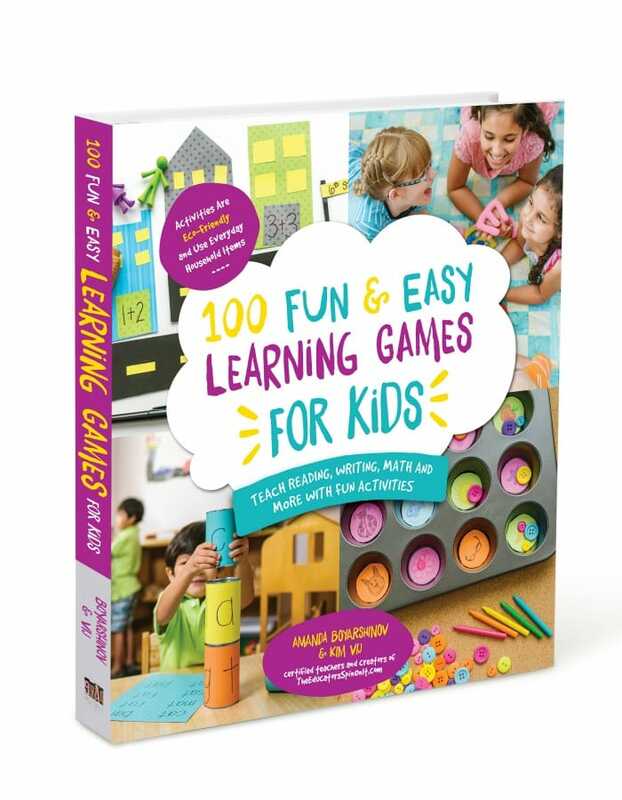 Plan an extra station for little hands that finish early and are waiting to switch stations. Draw the foods from the Story onto a large sheet of cardboard and have them try to get the bean bag into the holes. 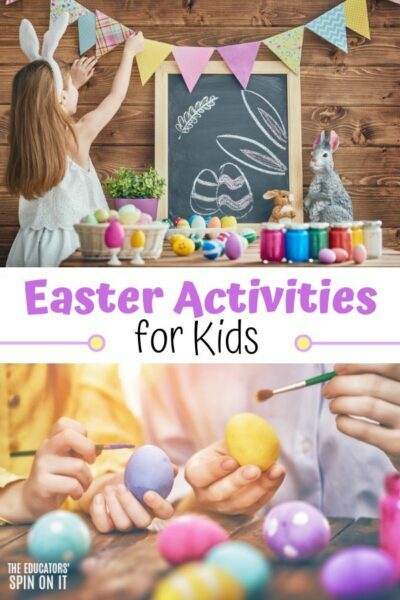 If parents want to buy something special for the teacher, encourage them to participate in a book basket to help build your teacher’s classroom library. 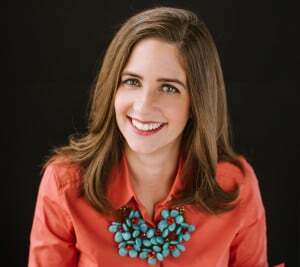 They don’t necessarily have to be new, garage sales and used bookstores are a great resource. When you present the basket attach one red and 3 green balloons to it so it looks like a caterpillar. We attached thank you notes to the balloons too! 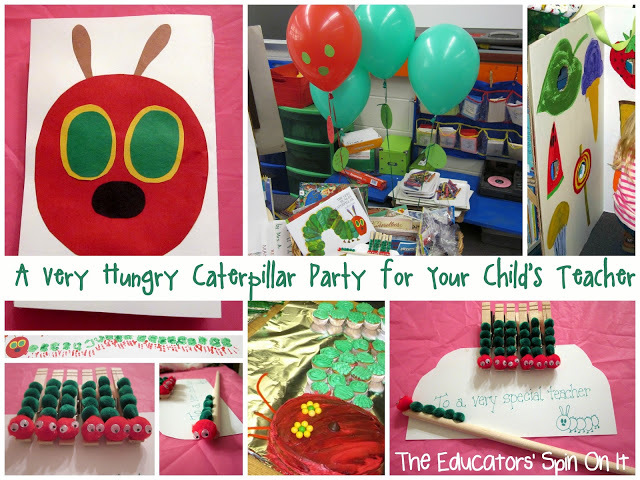 Need more The Very Hungry Caterpillar Ideas? 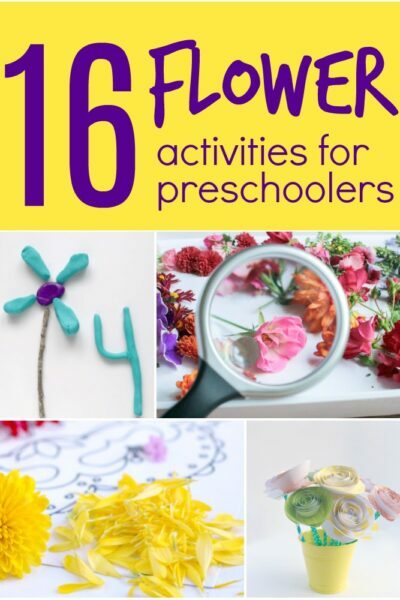 Check out our Pinterest Thematic Units Board and Party Board . Hope you enjoy your “Very Special Caterpillar Party” with your child’s teacher and class! 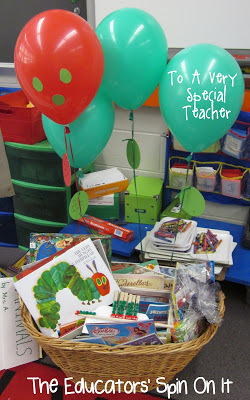 At the end of the party the Teacher will have a basket full of books, a teacher’s pointer, caterpillar magnets for her board, caterpillar thank you card, a personalized book about the school year, new copy of The Very Hungry Caterpillar signed by her students and some delicious Caterpillar Themed Snacks. 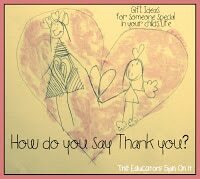 The kids will love it and and so will the teacher, what a special way to say thank you! Wow! I wish I could join you for this party! It looks amazing! Great job! What a lucky teacher! Great ideas! Thanks! We really had a good time and the kids loved doing this together for their teacher. Thanks Deborah! And thanks for pinning this party! It's a great idea for interns too which is who we used this party for. A great way to build up a new teacher's classroom.